Since the status feature has been added in instant messaging platform Whatsapp, users are quite like it. A few days ago we had told you to follow the steps to send images without spoiling quality on WhatsApp. Today we are going to tell you can check WhatsApp status without knowing anyone. Usually whenever you check someone’s Whatsapp status, the frontman knows who has checked his Whatsapp status. 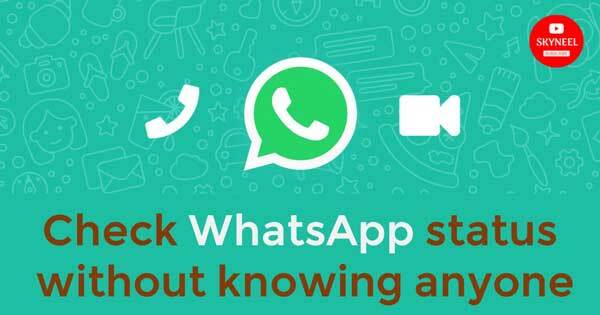 But there are some tips and tricks that will help you check WhatsApp status without knowing anyone. You must know that Whatsapp has a privacy feature that does not look like a blue tick on your chat after enabling. Also, your friends who send you messages also do not know whether you read the message or not. After enabling this feature, you will be able to see the status of all the users of your contact but they will not know that you have seen their status. You must follow the steps given below to check WhatsApp status without knowing anyone. Step 1. First of all, you have to tap on your Whatsapp app. Taping on the Whatsapp will open its home screen. Step 2. You will see three dots in the upper right on the home screen. You tap on this dot You have many different types of options when you tap on these three dots. Tap on settings from these options. Step 3. Once you tap on the settings, you will see several options again. From these options, tap on top account. Step 4. Once you tap on the account, you will see several options again. Tap on the top privacy of these options. Step 5. You will have a window open once you tap on privacy. Scrolling down there, you will see the option of Reed Receipts. Uncheck it. After unchecking, you will be able to check the Whatsapp app status of anybody but you have checked the status that they will not know. Step 6. Uncheck this Privacy will be enabled and you will not see Blue tick nor any receipts in your conversion will not see blue tick. In this article we have told you about check WhatsApp status without knowing anyone. If you liked this article then you can also like our Facebook page and subscribe to our YouTube channel too. If you have any problem related to this article, you can comment and tell us.